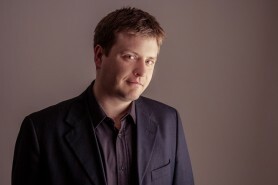 Born in Halifax in 1977, Countertenor Tom Williams began singing at an early age. A former chorister of Ripon Cathedral and a music scholar at Uppingham School, he went up to Cambridge University in 1997 where he read music. As Senior Choral Scholar in the world-famous choir of King’s College, he was musical director of Collegium Regale; an a cappella vocal ensemble formed by the choral scholars. With them and the main choir, he toured extensively in Europe, the USA, Australia and the Far East. He now works as a freelance singer, teacher and conductor. As a choral and consort singer, Tom has worked with some of the most prestigious ensembles and conductors in the world and has sung in major international venues such as New York’s Lincoln Center and the Sydney Opera House. He is a regular member of the EXAUDI Vocal Ensemble, who were finalists in the 2005 ROSL Competition and twice nominated for an RPS Award. He also sings in Polyphony and is a Choirman at the Temple Church. As a solo artist Tom enjoys both local and international engagements, recently appearing in the Théàtre L’Odéon in Paris as part of a live performance of music for Guy Maddin’s film Brand upon the Brain. He has been a soloist in concerts given in the presence of President Mikhail Gorbachev and Her Majesty Queen Elizabeth II. As a recording artist, he has appeared on many award-winning choral discs and is featured as a soloist with EXAUDI, singing the music of Christopher Fox on the Métier label, as well as on a recent release by the Temple Church Choir for Signum, singing Henry Purcell. Tom teaches singing at Uppingham School and also works as a vocal coach for the RSCM and the new National Youth Choir of Poland. He has delivered vocal workshops for a number of organisations including Leicester University and the Northampton Bach Choir and coordinated two Vocal Ensemble Courses at the Dartington International Summer School. He is Director of the Leicestershire Chorale, a leading amateur chamber choir that performs a varied and challenging repertoire from large-scale choral works to detailed a cappella pieces. As Artistic Director of Chorale’s YouthFindaVoice project, Tom works with students from over ten different colleges and high schools within the Leicestershire area. His brief in this role ranges from working with individual school choirs as a visiting vocal coach, to conducting over two hundred students in performance with a symphony orchestra. In a recent project, he recreated the Honda Civic Choir Advertisement of 2006, with over 100 students at a Leicester College, many of whom had never before sung in their lives, let alone recreated the driving sounds of a family hatchback! He has also directed the Finchley Children’s Music Group and the Temple Singers.